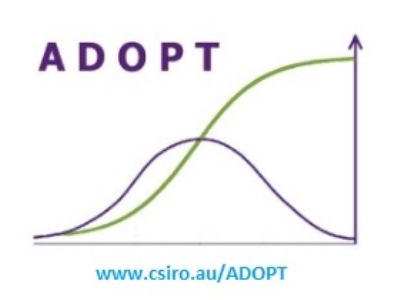 ADOPT assists those in agricultural research, development and extension (RD&E) to apply and understand factors likely to affect the adoptability of specific innovations for particular target markets. It uses a structured set of questions based on a well-established understanding of the socio-economic factors influencing the adoption of agricultural innovations. ADOPT has a set of 22 variables/factors that are empirically known to influence adoption. These are grouped under the four key areas and used as the basis for the framework. The reason behind its development is to provide a cost effective and effective tool to help develop adoption strategies based on the large body of research and understanding available. The tool aims to help people to accelerate peak of adoption and increase the scale of adoption for particular innovations. It is preferable to use it in a workshop setting. It uses a series of 22 questions, which once answered generate an “adoption” report including sensitivity analysis. 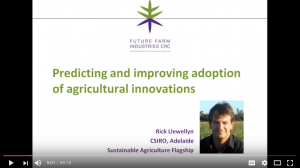 To hear Rick Llewellyn from CSIRO present on the ADOPT model hosted by John James, click on the image below. Developed country – The released Version 2.0 (2015) is available for download. Improvements include new sensitivity displays and improved relative advantage formulae. Users of earlier versions are strongly encouraged to replace their previous version. Smallholder – A new version is under development following the earlier beta release. Kuehne et al., 2011Kuehne, G., Llewellyn, R., Pannell, D., Wilkinson, R., Dolling, P., Ewing, M., 2011. ADOPT: a tool for predicting adoption of agricultural innovations. In: Proceedings of the 55th Annual National Conference of the Australia Agricultural & Resources Economics Society, 8–11 February, Melbourne.